Often times, a final judgment that is ordered and entered in a Florida divorce case or family law matter requires modification. Petitions for modifications can be made if you require modification of child support, visitation or timesharing, parental relocation or other major areas of your final judgment. Nilo J Sanchez & Associates is a Tampa divorce attorney who can represent you with any type of post divorce or court case. Attorney Sanchez works in multiple jurisdictions in Tampa Bay. Call for a consultation if you require a Family law post judgement modification in Tampa, South Tampa, Hyde Park,Ybor City, Carrollwood, Lutz, Land O' Lakes, Wesley Chapel, New Tampa, Wesley Chapel, Brandon, Valrico, St. Petersburg, Largo or Clearwater, Florida. Call today for a consultation, (813) 879-4600. Perhaps you have lost your job and need to ask the courts for either an upward or downward modification of child support or you believe that the spouse who is paying child support has not reported bonuses or raises that would effect your child support amount. Child support modifications can also be made based on the amount of timesharing you currently have that did not apply when your judgment was entered in family court. Child support modifications, whether you want to file a petition for change or if you have been served with a petition for modification of child support needs to be addressed promptly. We can help. As an experienced Tampa child support lawyer, we can help you get the best results for you and your family in a child support modification lawsuit. Read More > Child Support in Florida. If you believe there has been an unexpected and permenant change of circumstances with you or your ex, consulting with a divorce attorney can help you to take the steps necessary to modify your alimony. 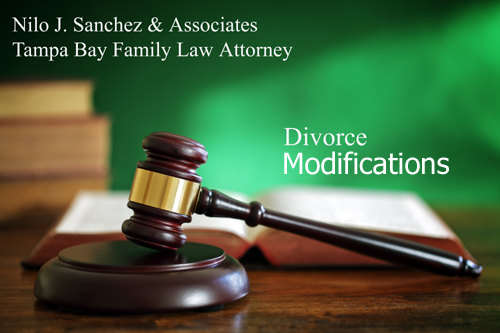 Learn more: Modifying alimony in Tampa Bay, Florida. Contact Nilo J Sanchez & Associates for a consultation. (1) there was a substantial, involuntary, material and permanent change in circumstances that was not anticipated by either party at the time of the final judgment; and (2) changing the timesharing schedule is in the best interest of the child(ren).Timesharing matters are governed by FL Statutes 61.13. Modification of Final Judgment. Parental Relocation. If you have been served with a petition to modify and relocate your children you have 20 days to respond. IF YOU FAIL TO TIMELY OBJECT TO THE RELOCATION, THE RELOCATION WILL BE ALLOWED, UNLESS IT IS NOT IN THE BEST INTERESTS OF THE CHILD, WITHOUT FURTHER NOTICE AND WITHOUT A HEARING. Call Nilo J Sanchez & Associates for a consultation and help with responding to this petition. The parent seeking to relocate with the minor child can do so by either obtaining the other parent’s written consent, which is put in the form of an agreement, or by obtaining prior court approval following a contested hearing for relocation of the child or children. Under the Florida law, the court evaluate certain factors when one parent seeks to relocate with the minor child and the other parent does not agree. Chapter 61.14 - Florida Statutes Regarding Petition for Modification of Support, alimony, maintenance orders.